Congratulations! You’re plus one today! 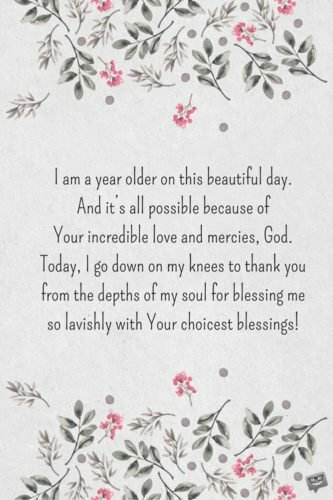 Here is an amazing collection of birthday prayers that are designed to, among other things, show gratitude to God for bringing you this far in life, uplift your soul and ask for guidance and protection in the coming year. So go ahead and commemorate your anniversary with any of the powerful prayers we have prepared specially for your big day. Lord Jesus, I can’t thank you enough for bringing me this far in life. I might not be a billionaire, but You have blessed me with life, good health, happiness and peace of mind. These gifts are worth more than all the money and treasures of the world. Thank you so much. And please, keep on smiling on me. You are my sunshine, dearest heavenly Father. I pray that You continue to transform every darkness in my world into the spectacular rays of the sun. Thank you for filling up my life with countless blessings. Dear Lord, please draw me closer to Your mighty presence and bless all my days. Amen. 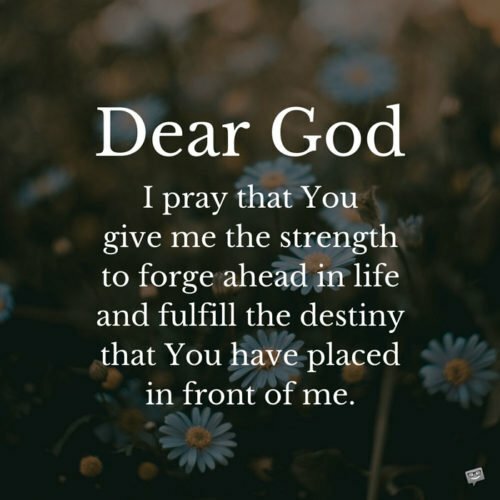 Dear God, today, I pray that You give me the strength to forge ahead in life and fulfill the destiny that You have placed in front of me. 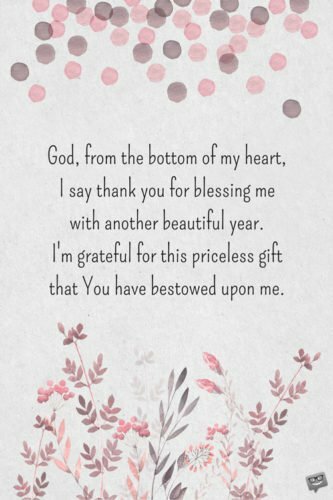 God, from the bottom of my heart, I say thank you for blessing me with another beautiful year. I’m grateful for this priceless gift that You have freely bestowed upon me. Dear God, I thank you today for the precious gift of life that You have blessed me with. I pray that for as long as I live I will continue to do things that please you. Thank you so much, Father. God, all I ask from you on my birthday is that you give me the ability and strength to love and serve you faithfully, come what may. On this special day, I thank God for His remarkable blessings in my world and pray that He will continue to protect me from the eyes and plans of my enemies. Lord, please keep sadness away from my heart and worries from my mind. Bless me with a life of happiness, good health and good fortune. Happy birthday to me! As I observe my birthday today, I pray that God will draw me nearer to Him and fill all my days with happiness and His amazing grace. Sweet Jesus, it’s my prayer that your immeasurable love will shine in my life and guide my path for as long as I live on this earth. On the occasion of my birthday, dear God, I pray that you change my life positively. Thanks for answering my prayer. Precious Father, please immerse me in the blood of Jesus Christ and send Your holy angels to wrap their mighty wings around me as I commemorate my birthday today so that I may be protected and blessed until the end of time. In the mighty name of Lord Jesus I pray. Amen. God, because You love me so much, I am a happy and prosperous man/woman today. I pray that You will continue to love and bless me for as long as I live. Thank you so much. Heavenly Father, all I want for my birthday are your blessings. I hope You give me an abundance of that today to last me a lifetime. I love You so much, dear God. God, please be with me…today and on all the days of my earthly journey. God, thank you for giving me the unique opportunity to be able to wish myself a happy birthday today in good health and happiness. I pray that You will continue to bestow blessings of health and joy on my life. Thank you. My phenomenal Creator, you make every day of my life so wonderfully beautiful, as only You can! Without Your divine love and blessings, I’d be absolutely nothing. May nothing ever separate me from Your love and favor. Dear Father in heaven, on my birthday, I pray that You bless me with a lifetime of joy and peace. Thank you, Father, for I know you have already answered my prayer. Father, since I accepted you as my personal savior, my life has become simply happy and wonderful. Today, I pray that You continue to bless me with happiness. I have received so many priceless gifts from you, my dear God, and cannot wait to receive more amazing blessings from you. Thank you for loving me the way You do. I promise to worship You forever and ever. 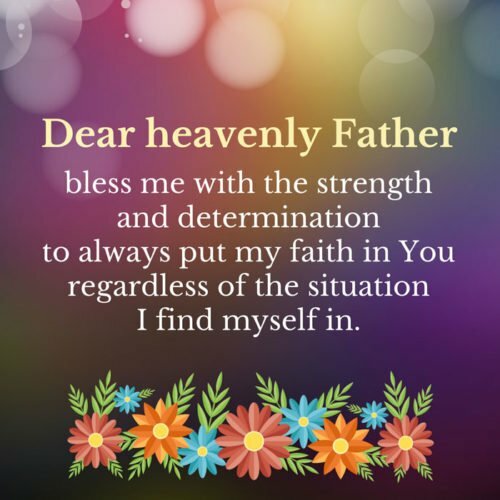 Dear heavenly Father, bless me with the strength and determination to always put my faith in you regardless of the situation I find myself in. Lord, all I ask from you on this special day of mine is that you constantly watch over me, bless me and keep me healthy all the days of my time on earth. Father, I pray that my life will always experience happiness and see success. Amen. 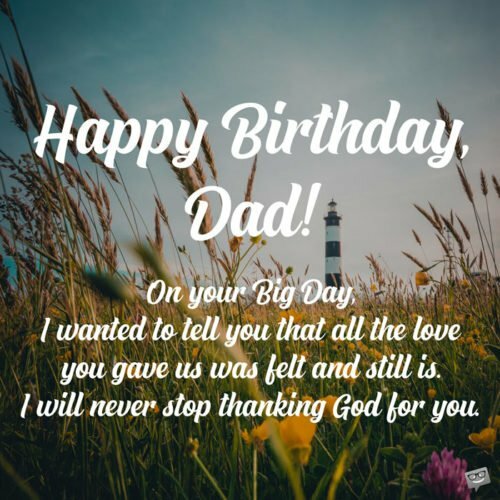 On my birthday, dear Father in heaven, I pray that You will give me an abundance of peace and joy to last me for an eternity. I’m proud to be Your child. Thank you, God, for blessing me with yet another Big Day. Please, bless and protect me in the days ahead so that my heart may know true happiness. God, thank You for making my days as remarkably bright as the sunniest day of the year. Some people look for happiness in wealth and other material things. For me, my happiness lies solely in God’s love. I pray that I receive oceans of that every second of my life. 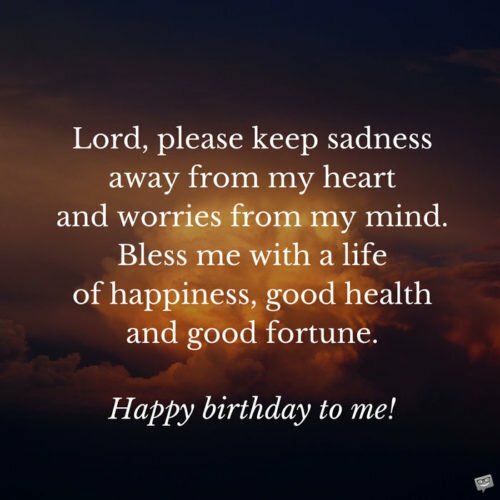 On my birthday, I pray that the good Lord will forgive all my sins and bless me with good fortune. Awesome God, please, don’t let the joy I feel in my heart on this special day of my existence to die. 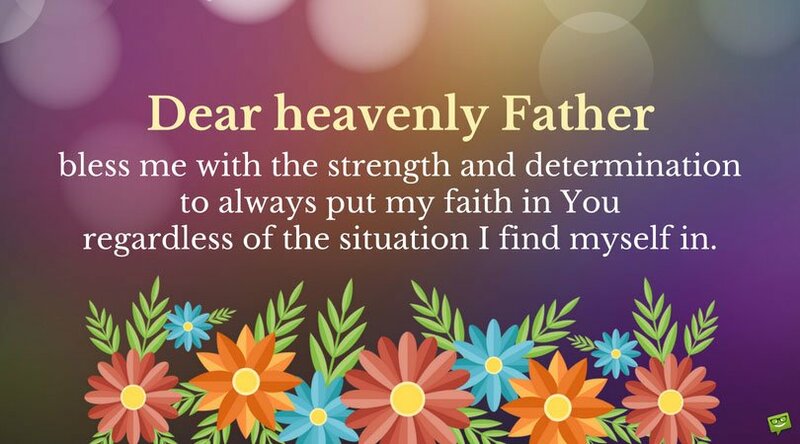 Father, You are the reason I am alive. You are the reason I have joy in my heart. Please, continue to give me life and fill my world with Your heavenly joy. Amen. Hurrah! I am a year older on this beautiful day. And it’s all possible because of Your incredible love and mercies, God. Today, I go down on my knees to thank you from the depths of my soul for blessing me so lavishly with Your choicest blessings! On this remarkable day, I thank you, Lord, for giving me the air that I breathe. I thank you for giving my body and bones the strength they need to function properly. I thank you for the amazing family members and true friends You have surrounded my life with. I thank you for the happiness that You have put into my heart! Thank you for everything, my dearest heavenly Father. Good Lord, please bless me abundantly today and give me the strength and courage to never stray from the path of righteousness. Thank you for gifting me another year to enjoy this beautiful world you created for mankind. Sweet Jesus, please keep me alive and healthy to enjoy all the fruits of my labor. Amen. 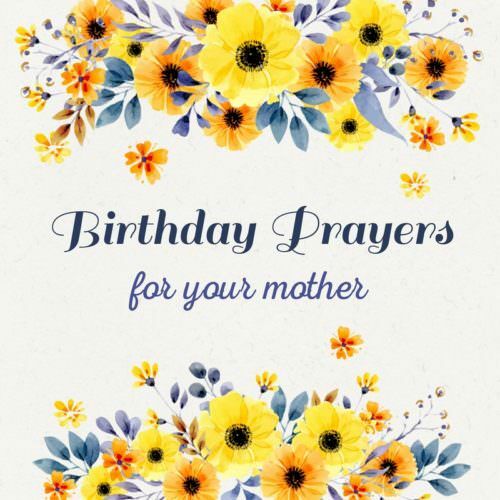 Birthday Prayers for Mothers | Bless you, Mom!